The challenge here was to raise the profile of a partnership between a division of Pam Golding Properties and four hospitality industry focused specialist service providers. 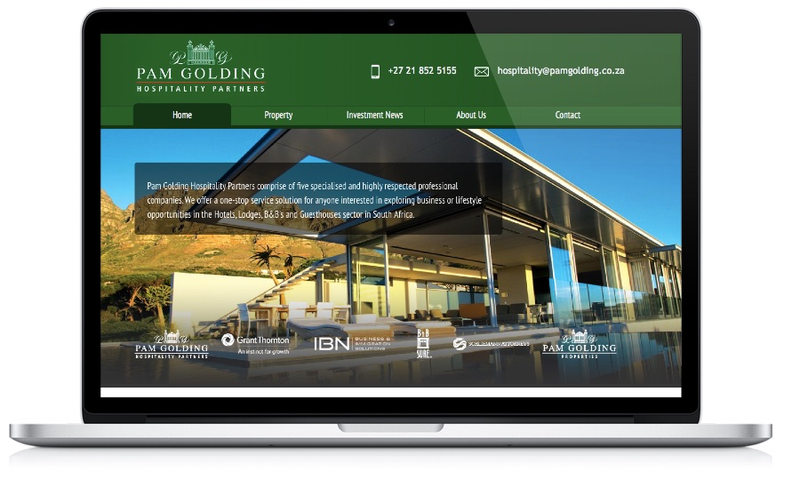 Whilst evaluating the brief for a new responsive website, we recommended that the partnership rebrand to adopt the Pam Golding name and brand identity, in order to benefit from the authority of a leading name in the South African property sector. The credibility that the Pam Golding name gives the brand is particularly valuable for the target audience is primarily the international investor. We were minded that such an investor may not be familiar with local place names, so we feature map-based and filter-based searches, in addition to featured properties on the home page. We profile the services of each of the partners and highlight that they together uniquely offer a one-stop service solution for the investor. We also profile the thought leadership of the partners, each industry leaders in their sector, with investment news structured by partner.